I've been interested in heraldry for a long time, that's why I had the coats of arms in my family drawn up a few years ago. There are three coat of arms in my family. Two of them have been around for hundreds of years and one was designed in the late 70's/early 80"s. I'm now at the point where I want to assume arms. I have a few questions about the arms in my family, I hope you can help me with these questions. The pictures below are bit stretched because I re-sized them quickly. This one was registered with the CBG (Central Bureau for Genealogy in the Netherlands) for all descendants of Cornelis Ariensz. Treur alias Lantheer(first of the name) except for the descendants of the next registration. 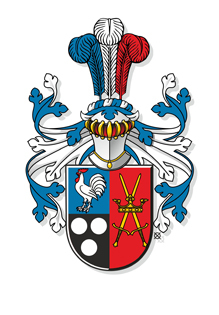 The problem is that these arms are only known to have been used by the oldest branch in the family. The first known users and the first Landheer are seperated by roughly 3/4 generations. It is possible that these where used by my forefather. He was Schepen (best translation: Alderman) of Oud-Beijerland and so were many of his descendants in the oldest branch. Many Schepenen adopted arms to seal official documents in the Netherlands, that's why it realy could be his arms. I've heard of arms being based on known arms, when no direct direct link can be established. I have two questions about that: Is this also true in the Netherlands? (I have never heard about it) And second: If this is possible, what kind of link do you need? This one was also registered with the CBG (Central Bureau for Genealogy in the Netherlands) for all descendants of Cornelis Ariensz. 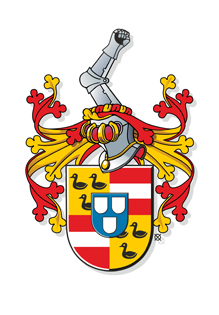 Treur alias Lantheer(first of the name) except for the descendants of Huijg Landheer from the previous arms. These arms originated in the female line. Found in the will of Adrianus Landheer, where he's stating that his children should adopt these arms in remembrance of their Mother. I really don't feel comfortable using this one because of this reason. It is definitely not my right to use these arms even though the registration says I can. These arms were designed for the family society(no longer existing) to serve as a coat of arms for the descendants of Cornelis Ariensz. Treur alias Lantheer. This because of the uncertainties coming with the previous shown arms. My problem with these arms is the field above the millstone. It's a reference to the place my family originated from. Is this a correct heraldic use of that field? I heard about those fields being used to show a persons position, like in the HRE. The last option is designing new arms, but that doesn't have my preference at the moment. I hope that the answers I get can help me decide what to do. Thank you for reading this and I hope you can help me! I think before ruling any options out - we should first have to find a member from the Netherlands so the customs there can be adhered to. However, there are places where arms are in use from or by both sides of the family (Spain comes to mind). A note has been sent to someone we hope will weigh in soon. As to the chief in the third set of arms, it appears to be similar to that of Bavaria, but this is not the same. Your chief is barry bendy sinister whereas Bavaria is fusilly sinister. So, if you'd have a bit of patience, we're working on getting the right people in the mix. 1) Arms were/are based on existing arms especially when there is a susppected link which can't be proven. In the old days younger sons changed the colours of the arms of their father to indicate they had started a new branch. This principle can still be done but also change the crest so it is clear that this is another branch of the family. 2) there is nothing to be uncomfortable about. In fact it happened often that the arms of the mother were taken by the descendants. This had mostly to do with the fact that the family of the mother was more important or had a richer history but that was not always the case sometimes the father just didn't have arms and started using those of his wife. 3) it could show a position yes but not always in this case it just to show where the family originated nothing bad about that. 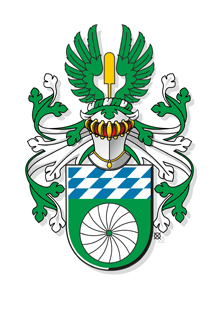 The chief is based on Bavaria. It's a reference to the town of Oud-Beijerland which was named after Sabina van Beieren (Sabina, Duchess of Bavaria), that's why it looks like that. These arms are the only ones I know the meaning off. The millstone because a lot of Landheren were Mill owners and the bakers shovel for the profession of baker. Ton de Witte wrote: 1) Arms were/are based on existing arms especially when there is a susppected link which can't be proven. In the old days younger sons changed the colours of the arms of their father to indicate they had started a new branch. This principle can still be done but also change the crest so it is clear that this is another branch of the family. What would be the way to go? Do you have to change the crest and a part of the shield? Ton de Witte wrote: 2) there is nothing to be uncomfortable about. In fact it happened often that the arms of the mother were taken by the descendants. This had mostly to do with the fact that the family of the mother was more important or had a richer history but that was not always the case sometimes the father just didn't have arms and started using those of his wife. What I mean is that this is definitely not linked to me directly because it originates from the female line in a different branch. Thats why I thought it wasn't my right to use these arms. I also discovered today that the person that published our family's genealogy in our family book and in a publication of the KNGGW is also part of the KNGGW. I'm thinking about contacting her. They publish about heraldry and genealogy, so it could help. Her last publication about he family was 10 years ago, there could be new information about the two old coats of arms. I appreciate the help so far! Still thinking about what to do. I like the colors and simplicity of the newest arms, but the history behind the older ones attracts me a bit more at the moment. The way to go is for you to determine, as I said the most standard way is to change/reverse colours of the charges/fields. The crest change is to more easily identify the new branch of the family. In a nutshell it has to be clear that the new arms represent a different branch of the family and there are a few ways to do that.